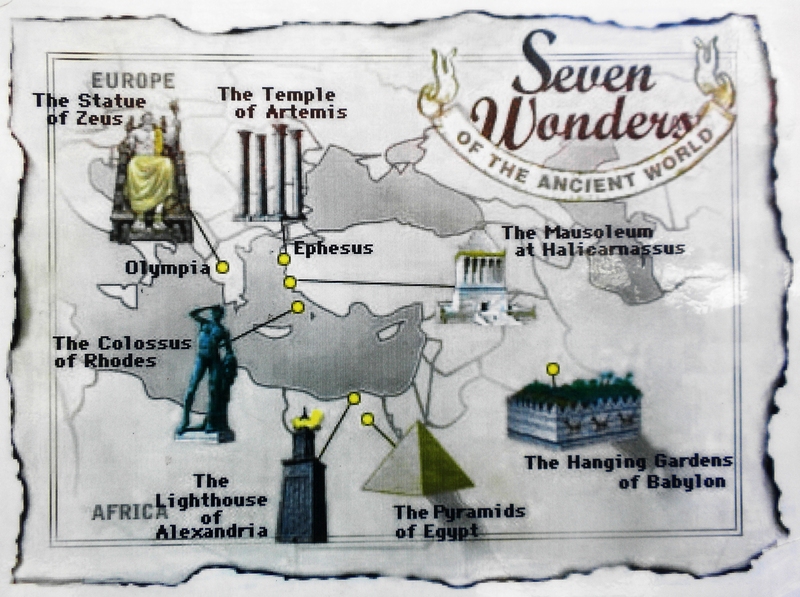 The Seven Wonders of the Ancient World were by no means a comprehensive agreed-upon list of the most impressive structures of the day. Today a list like this would be determined by a TV phone-in. The masterpieces included in the original list are the traditionally accepted Wonders as first set down by Philo of Byzantium although when he drew up the list he had no way of knowing about the Great Wall of China, the Treasury at Petra or Stonehenge. A group of three pyramids, Khufu, Khafra, and Menkaura located at Giza, Egypt, outside modern Cairo, is often called the first wonder of the world. 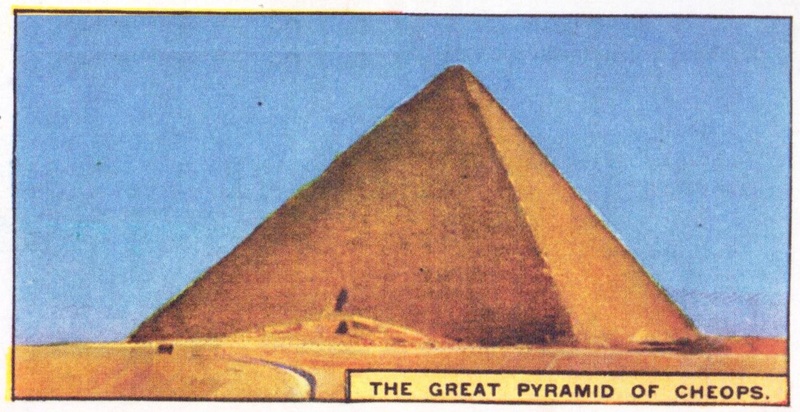 The largest pyramid, built by Cheops, a king of the fourth dynasty, had an original estimated height of 482 feet and the base has sides 755 feet long. It contains 2,300,000 blocks and the average weight of each block is 2.5 tons. The Pyramids are the only one of the Seven Wonders that still exist today. Often considered to be the second wonder, these gardens, which were located south of Baghdad, Iraq, were supposedly built by Nebuchadnezzar around 600 B.C. 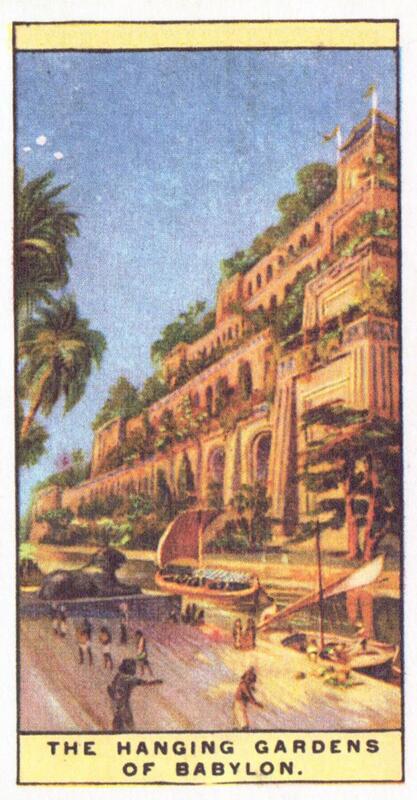 Archeologists think that the gardens were laid out atop a vaulted building, with provisions for raising water. The terraces were said to rise from 75 to 300 feet. No one really knows because of all the Wonders there is no archaeological evidence at all. Phidias (fifth century B.C.) built this 40-foot high statue in gold and ivory. All trace of it is lost, except for reproductions on coins. The temple was a beautiful marble structure, begun about 350 B.C., in honour of the goddess Artemis. 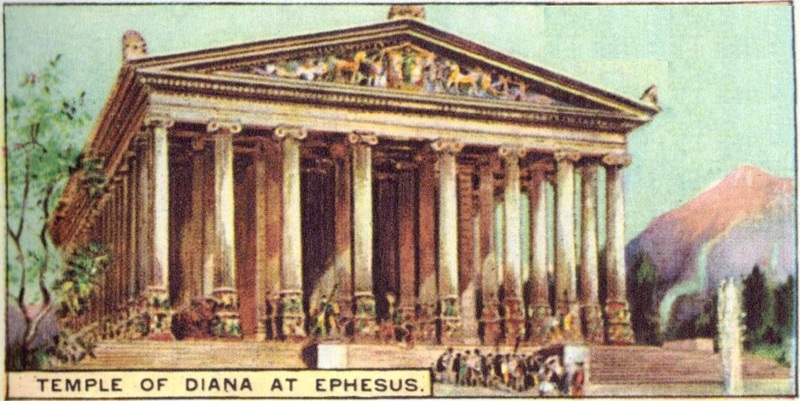 The temple, with Ionic columns 60 feet high, was destroyed by invading Goths in A.D. 262. This monument was erected in Bodium, Turkey, by Queen Artemisia in memory of her husband, King Mausolus of Caria in Asia Minor, who died in 353 B.C. Some remains of the structure are in the British Museum. This shrine is the source of the modern word “mausoleum,” which is a large above-ground tomb. All that remains now are a few toppled columns and splintered stones and a hole in the ground where the burial chamber once was because all of the usable stones had been previously carted away by the Knights of St John who needed a convenient supply of stone to build their castle. The Knights of St John have quite a lot of lost architectural heritage to answer for it would seem and if the World Heritage Organization had existed in the fifteenth century I think they may have had a great deal of explaining to do to the Director-General of UNESCO! 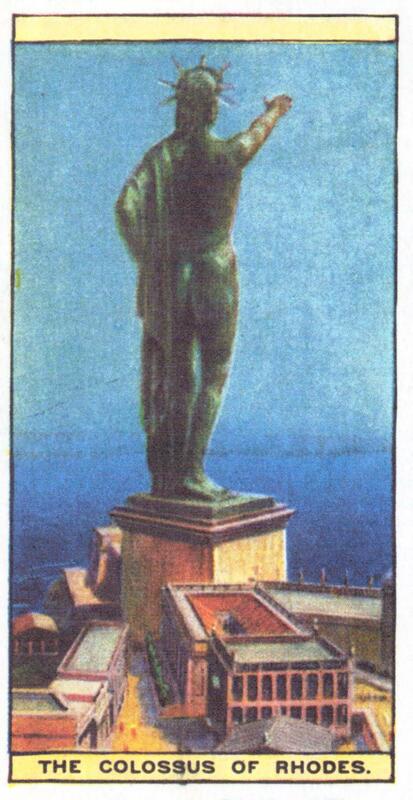 This bronze statue of Helios (Apollo) was the work of the sculptor Chares, it represented the sun god Helios and stood at the harbour entrance but a strong earthquake about 226 BC, badly damaged the city and toppled the Colossus. Legend has it that Helios himself was displeased by the statue and forbade the Rhodians from making any attempt to rebuild it so for the next eight centuries, give or take a few years, it lay in ruins until it was sold to a Jewish merchant who was reputed to require nine hundred camels to haul it all away. A fully laden camel can carry four hundred and fifty kilograms so that would be roughly about four hundred tonnes of bronze, by comparison the Statue of Liberty weighs two hundred and twenty-five tonnes and is forty-six metres high so using this dubious logic the Colossus of Rhodes would have been ninety metres high and huge. 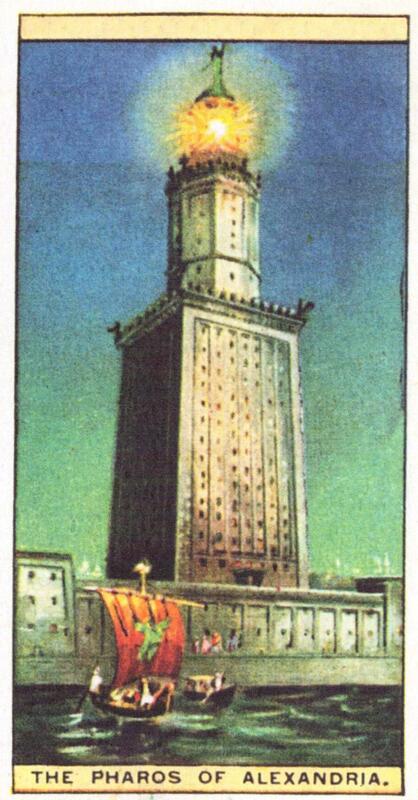 The seventh wonder was the Pharos (lighthouse) of Alexandria. Sostratus of Cnidus built in the Pharos during the third century B.C. on the island of Pharos off the coast of Egypt. It was destroyed by an earthquake in the thirteenth century. 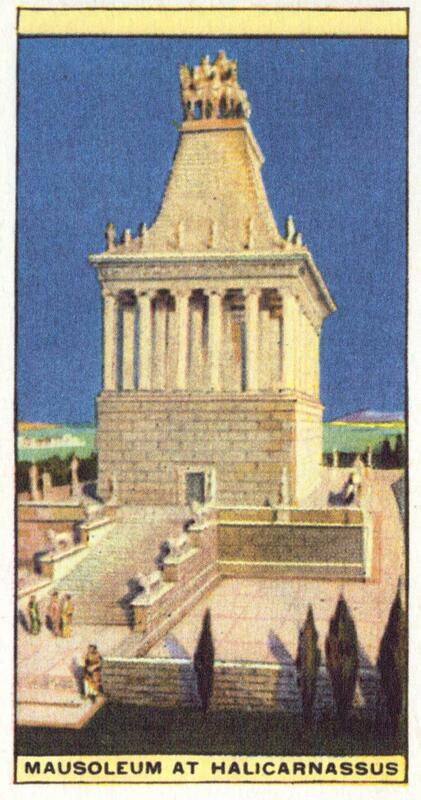 The seventh wonder was the Pharos (lighthouse) of Alexandria. 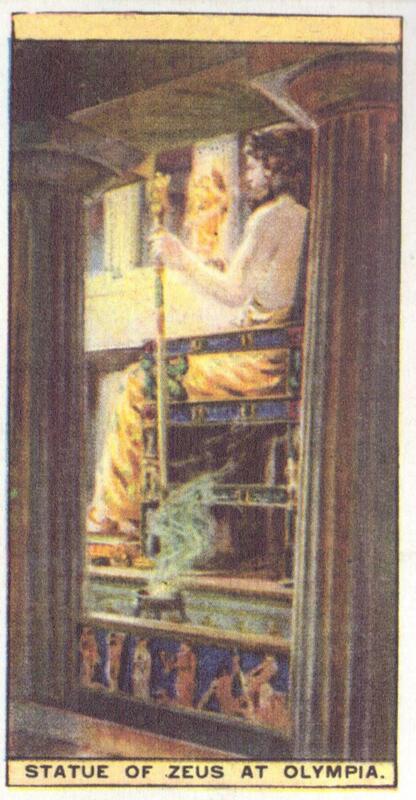 Sostratus of Cnidus built the Pharos during the third century B.C. on the island of Pharos off the coast of Egypt. It was destroyed by an earthquake in the thirteenth century.